The first three months of a baby’s life is an outside-the-uterus period of intense development, a biological bridge from fetal life to preparation for the real world. The fourth trimester has more in common with the nine months that came before than with the lifetime that follows. This comprehensive, intimate, and much-needed "operating manual" for newborns presents a new paradigm of a baby's early life that shifts our focus and alters our priorities. Combining the latest scientific findings with real-life stories and experiences, Susan Brink examines critical dimensions of newborn development such as eating and nutrition, bonding and attachment, sleep patterns, sensory development, pain and pleasure, and the creation of foundations for future advancement. Brink offers well-informed, practical information and the reasons behind her advice so that parents and caretakers can make their own decisions about how to care for a newborn during this crucial period. The Fourth Trimester assures readers that infants are as biologically capable as they are physically helpless. They thrive on what is readily available in every household: consistent, loving attention. The Wonder Weeks: How to stimulate the most important developmental weeks in your baby’s first 20 months and turn these 10 predictable, great, fussy phases into magical leaps forward. In this important work, Brink shows us something rare in the baby book world: an author that knows who parents are, what they need, what is supportive, and what is really good science. She knows the distinctions between value judgments and what we know to be true, scientifically. Brink's ideas couldn't be more appropriate to our historical moment.James. J. McKenna, P.h.D., Director, Mother-Baby Behavioral Sleep Laboratory, University of Notre Dame "
"The Fourth Trimester will appeal to the audience of young parents. It has lots of helpful information and the idea of a fourth trimester is a helpful concept. Very readable! "Penny Glass, Developmental Psychologist, Head of Child Development Program, Children's Hospital, Washington D.C. This book was helpful in understanding why babies are the way they are. During the first three months of their life, they are still developing, just like in the womb. Only know they are doing it outside the uterus. The medical background and research that supports this book gives great insight into just what it is we, as parents, need to do to provide the best care for a newborn. I would highly recommend this book to any new expecting parent. I’ve read a number of pregnancy/parenting books over the last 6 months and this was by far the most helpful and palatable for getting ready for motherhood. 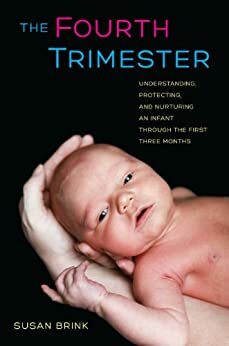 The author uses a great blend of science and compassion and common sense to walk expecting/new parents through those first chaotic months of having a newborn- how to prepare, what to consider, what’s best practice, while continuously reminding you there are no set rules, and to be flexible with yourself and your baby. Great book. Sound advice with solid research to back it up. I appreciated the current research that debunks some old myths (specifically what a baby can see the first 30 days), as I train postpartum doulas and new parents. It's good to have the research to fall back on. The information was laid out in a way that made it easy to read (not at all like a text book). Thank you Susan Brink! This is a great read that is not filled with fear based research. I am fascinated by the concept of an additional trimester of bonding and nurturing. I highly recommend this book to new or experienced mothers. My favorite book post pregnancy.